Yesterday, I got home from an amazing vacation. Planes, trains, and automobiles (and even a ship!) took us on a nearly 8,000 mile roundtrip vacation. We saw glaciers, seals, redwoods, the Golden Gate Bridge, Alcatraz, and a whole lot more as we traveled through Alaska, Canada, Washington, Oregon, and California. I could talk about it for days, but for the moment, I’ll just share what I ate. And that was a lot. 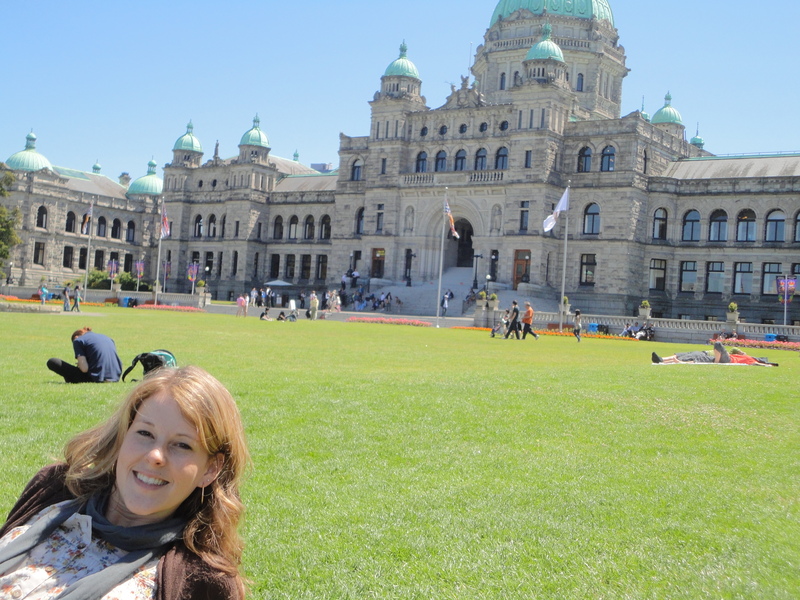 This is me in front of Parliament in Victoria. One of the rare moments I wasn’t eating. In twelve days, I gained about six pounds. (Yikes!) My feeding frenzy started on a cruise, but truthfully, I think a gluten-free diet could successfully be done there. My mom pretty stringently stuck to a gluten-free diet (minus a couple cheats), and the crew was very accommodating. They took her order the night before for each meal, so they could prepare her food in a separate pan. Although the selection was not tremendous, the buffets were labeled with gluten-free options, and there was even gluten-free bread available. (It wasn’t as good as Udi’s, but it was nice to have.) Even I did okay in this portion of the trip. I cheated, but it was typically purposefully and not with complete abandon. I ate lots of meats, eggs, rice, potatoes, as much fish and seafood as I could get, fruits, and veggies. The key here was I ate A LOT. The A LOT happened to include a lot of healthy stuff, mixed in with more special-occasion cheating than normal. Traveling off the ship was another story. For our first lunch I was golden. Chicken, rice, and salad. Then we got on a train. We were supposed to be on the train for about six and a half hours. We were going to eat a very late dinner when we got to Eugene, but twelve miles south of Portland, we got stopped behind a broken down freight train for two and half hours . . .
Have you ever eaten in Amtrak’s dining car? If there’s a fancy one, it wasn’t on our train. Chips, candy, a couple sandwiches, and microwaved dinners were on the menu. They did have some Tillamook cheese, though, Oregon friends! That was our snack before we realized were going to have to eat supper there too. Turns out they didn’t have any gluten-free microwaved cheeseburgers on that particular train. 1. Traveling via plane and then continuing travel without access to a refrigerator. 2. Being stuck on a train. For a long time. 3. Road-tripping through rather remote parts of the country. I would not have considered northern and north-central California remote until we drove through it. One day I ate Ho-Hos and Pringles for lunch. Again, lazy, but in my defense, the Shell station was about the most enticing place I saw between Fort Bragg and Mendocino. Who knew?? Do you have gluten-free vacationing tips? If so, I would love to hear them. My mom is probably going to have to undergo some more testing, but she has a new doctor who is convinced she has Celiac, and I really just tend to feel better without gluten. As much as I enjoyed some of my indulging, I’m looking forward to getting back to healthier, more balanced, and gluten-free eating. Please share your tips! I’d love to hear them! This entry was posted in gluten-free and tagged eating well, fast food, Gluten-free vacationing, travel, vacation by kenzihoward. Bookmark the permalink. Check out my blog Gluten-Free Globetrotter for tips about traveling gluten-free! Erin, thanks so much for sharing! I saw your post about the gluten-free tour of Tuscany—what a fantastic idea! I have a family member with celiac. It is particularly hard to eat casually, or on a budget, as most lunch or snack items have gluten (sandwiches, pizza, empenadas, etc). When we travel abroad we always bring “celiac cards” written in the appropriate language, to make sure the servers understand!